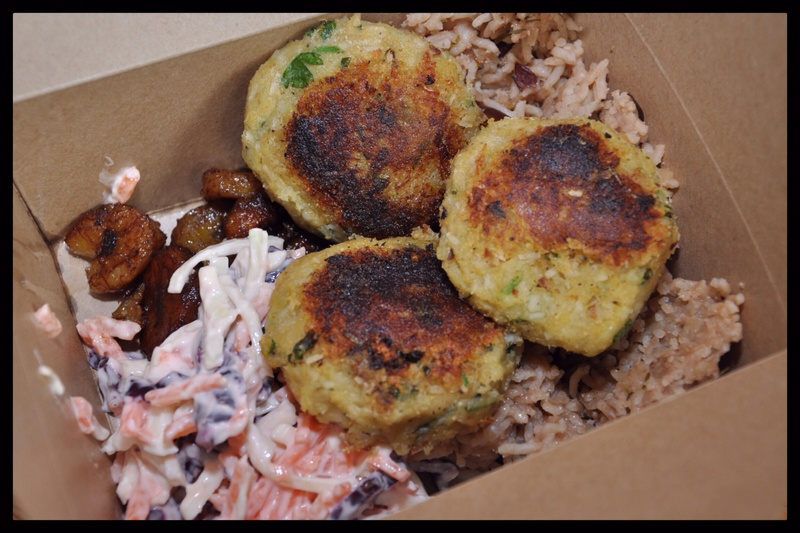 Trinity Kitchen has brought five new street food traders in this month. 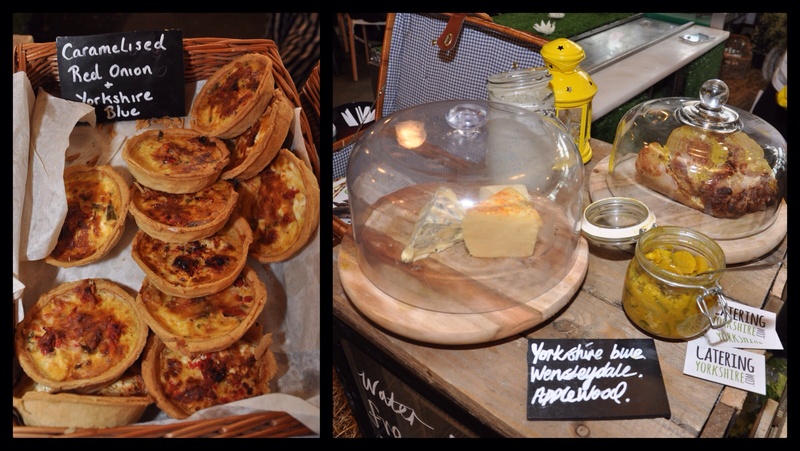 It’s great to have 100% new traders to keep things fresh and interest high, as I feel the last couple of months it seemed the novelty of Trinity Kitchen was wearing off slightly, and the hoards being drawn in wasn’t as consistently regular as first hoped. 1. 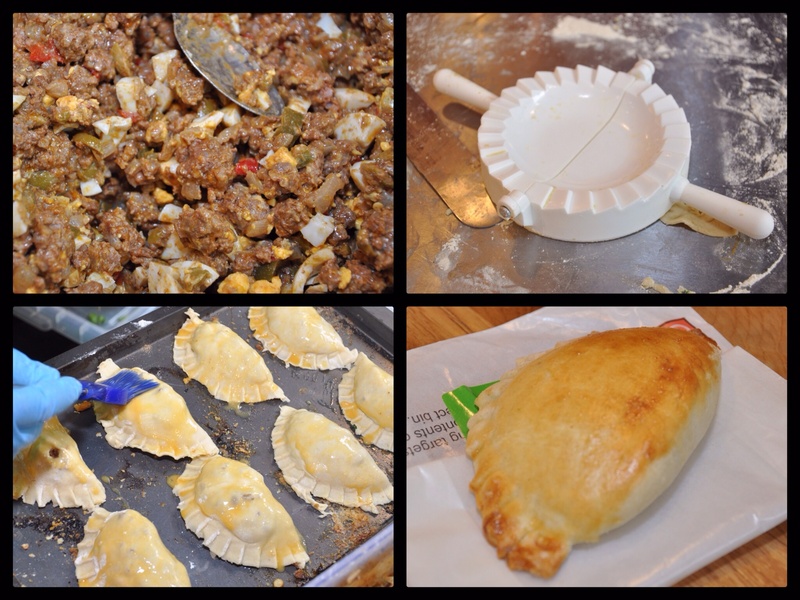 Hay Latin America aren’t newcomers to street food in Leeds, you may have seen them at Briggate’s World Feast recently. Having drawn inspiration from traveling around South America, their menu has a fresh quinoa salad with Peruvian style marinated chicken, Brazilian cheesy dough balls, Spinach and ricotta empanadas and unforgettable Alfajores, these small shortbread sandwiches were heavenly, THE best shortbread I’ve ever had!! 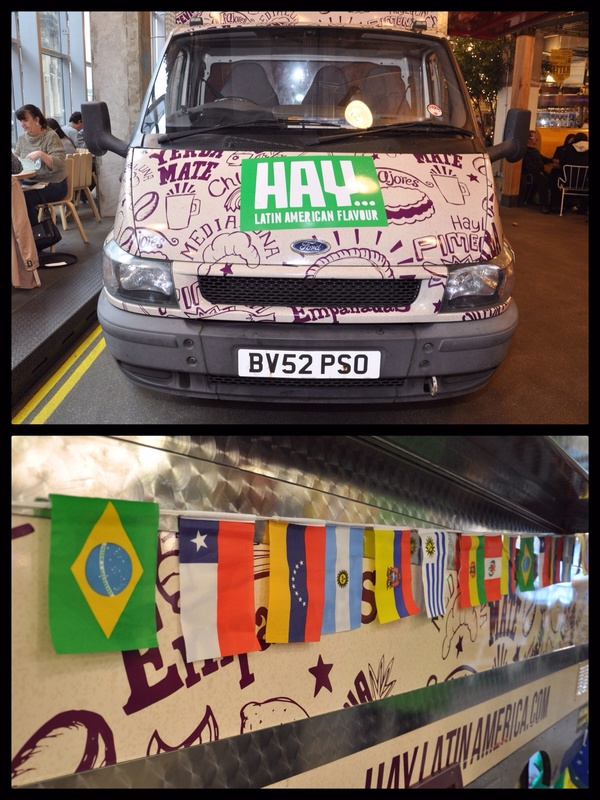 Over the coming weeks their menu will change with regular specials, the first being a Chilean-inspired hot dog! 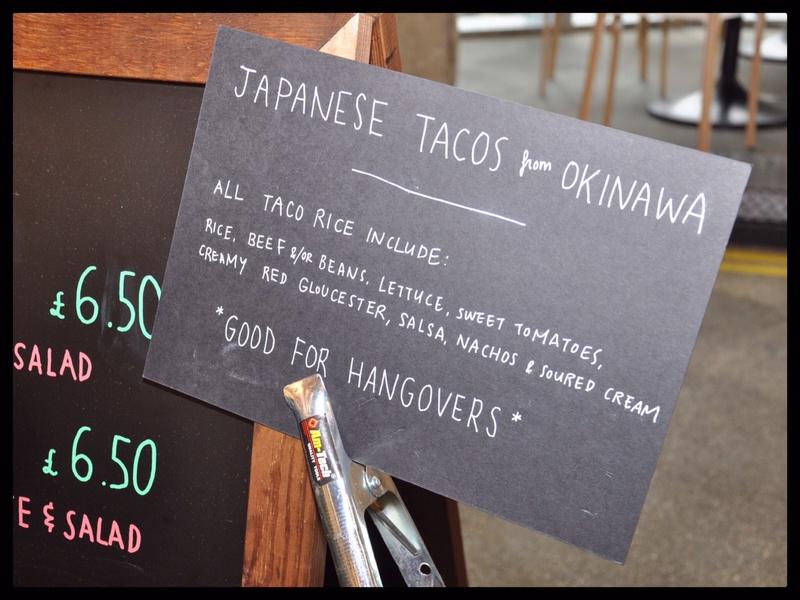 Prices: £1.10 – £6.50. Quinoa salad – lots of fresh flavours. 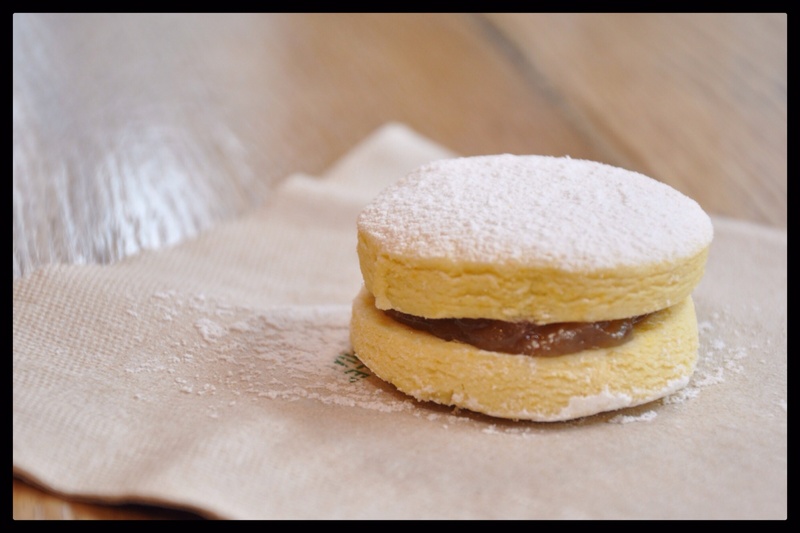 Alfajores with Rhubarb compote – absolutely melt in the mouth, the best shortbread I have EVER eaten. 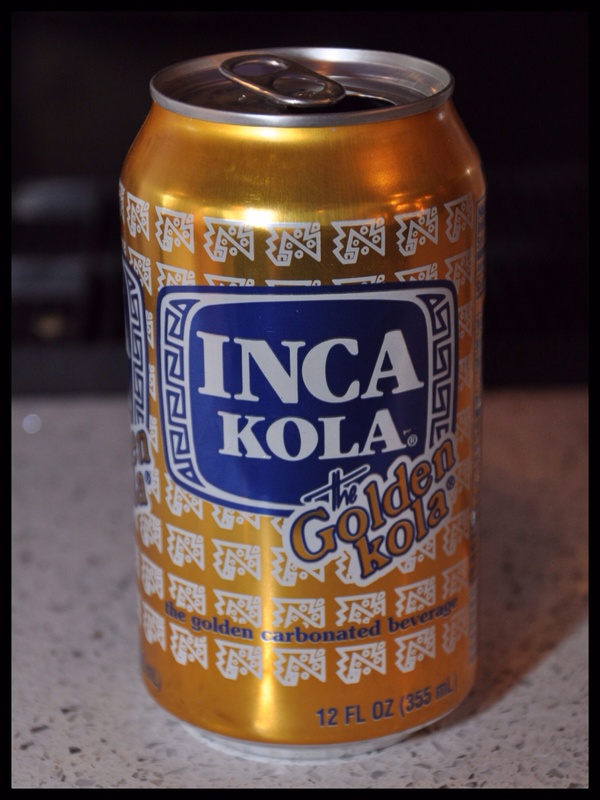 Inca Kola – was lucky enough to get the last one of the current stock. Tasted like a weak Irn-Bru. 2. 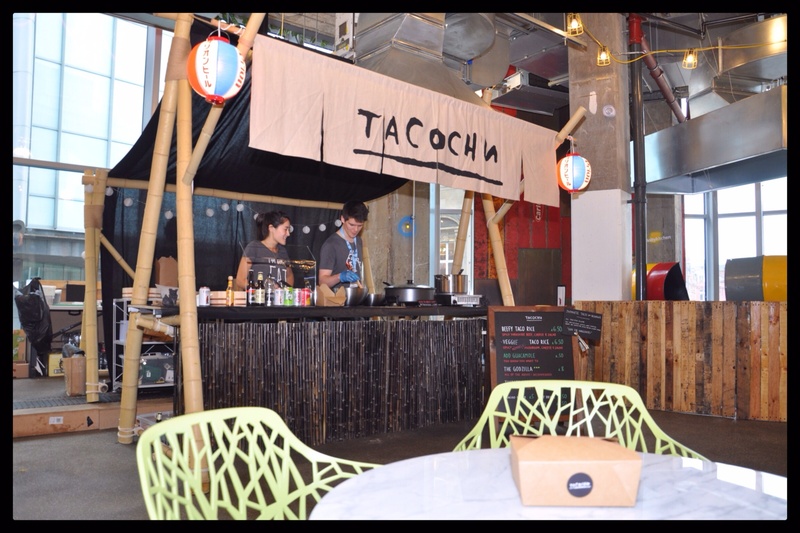 Tacochu run by Hackney-based Erica, is serving up Taco rice from Okinawa, a combination of American taco filling with Japanese rice. 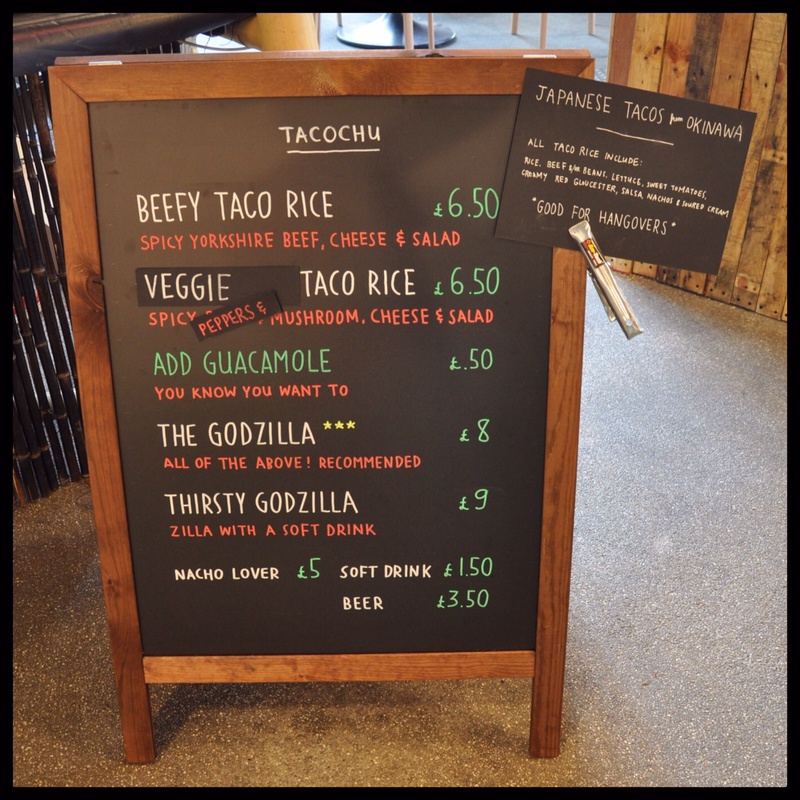 I had the Godzilla (£8) with everything. 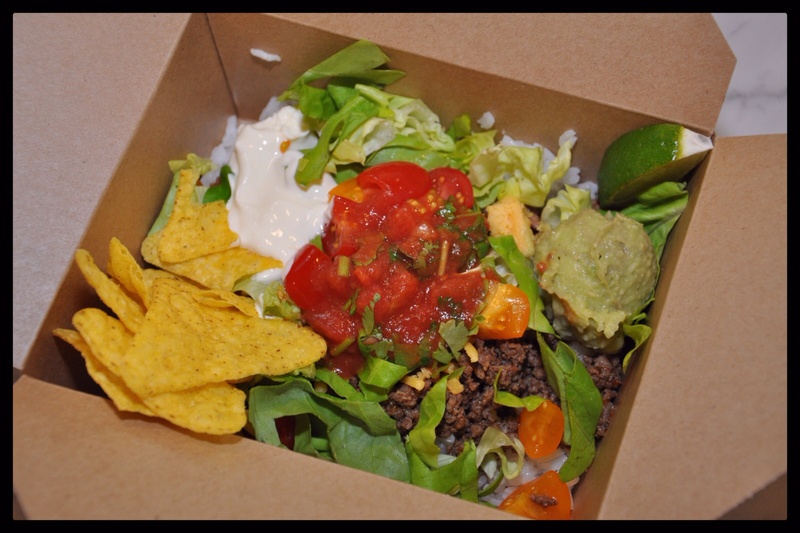 It was a mixture of flavours and textures, with lots of freshness from the salsa and salad, a hint of spice in the beef, sticky rice and lastly tortilla chip crunch. Filling to boot, I really enjoyed it. Prices: £1.50 – £9. 3. 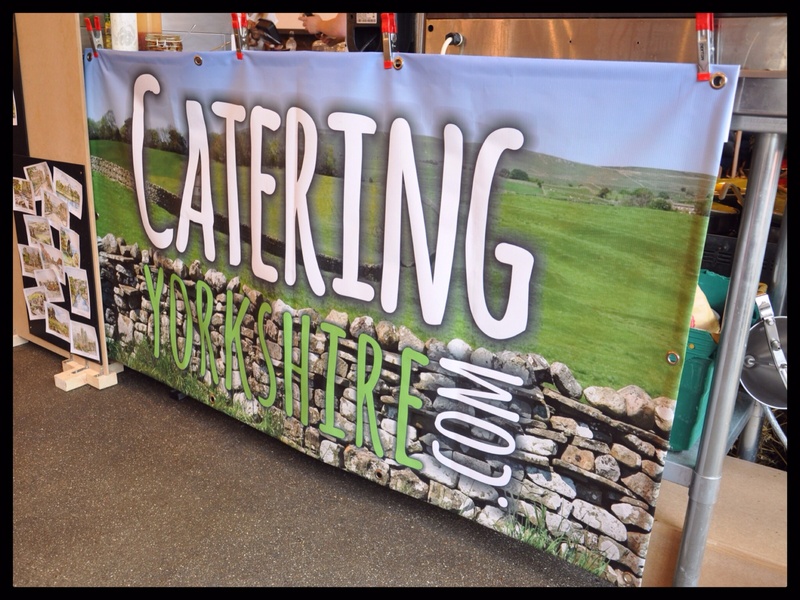 Catering Yorkshire are new to street food, but don’t lack experience in the food industry, with over 20 years experience running hotel kitchens such as Malmaison and Rudding Park. 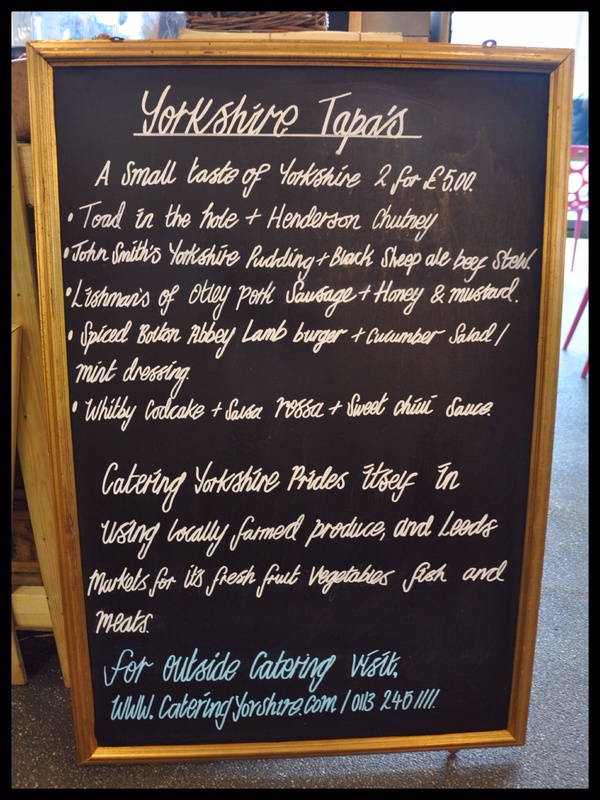 Currently they cater at The Northern Ballet and Stockeld Park. 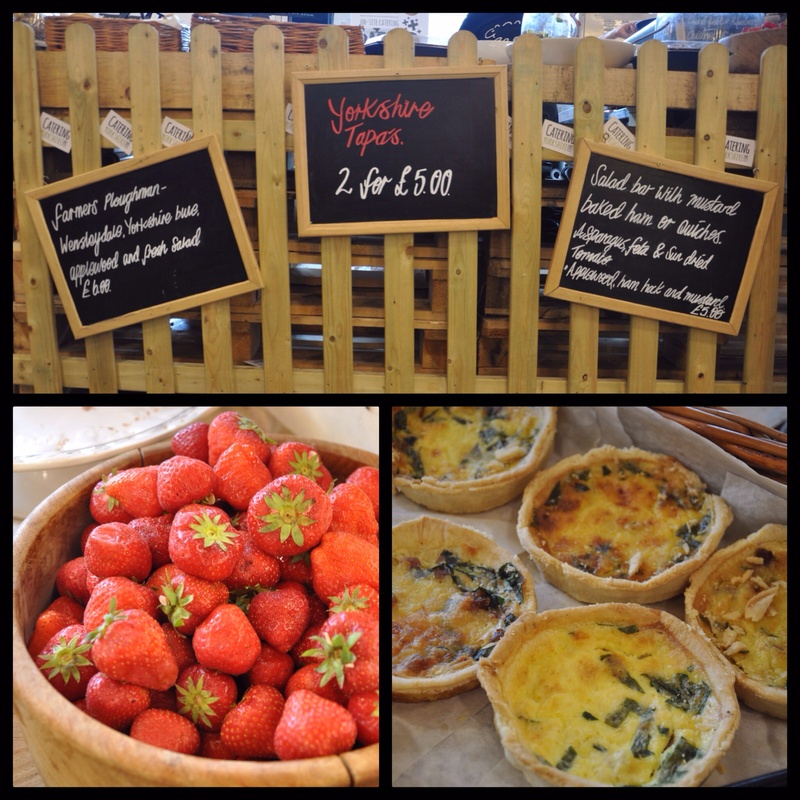 Their produce is locally sourced from Leeds Markets and is served up in different guises, with a fresh salad bar, Yorkshire-inspired tapas and desserts like Yorkshire mess for anyone with a sweet tooth. Prices: £5-6. 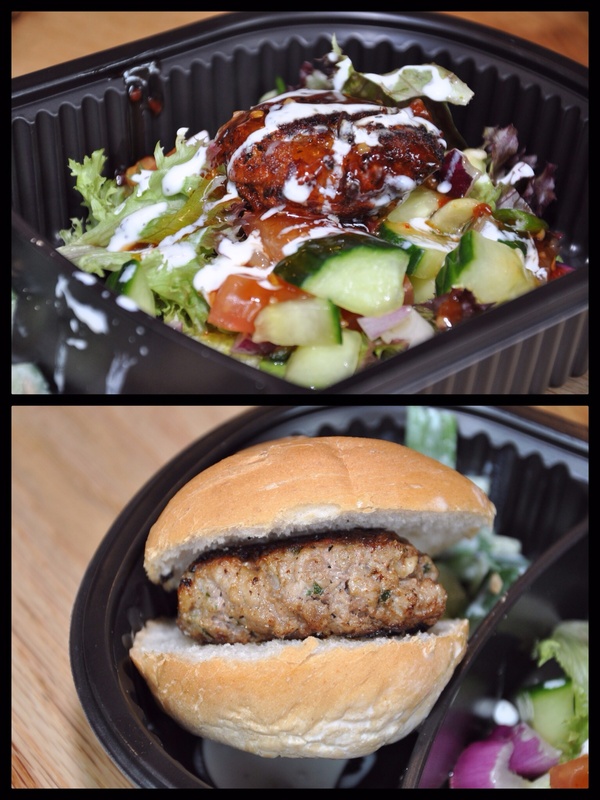 I tried the Lamb burger and Whitby Cod Cake with salad (£5) which I enjoyed. The cod cake came with a lovely fresh salad and I liked the sweet chilli sauce. However, I would have preferred the lamb to have been spicier and the cod cake to have been bigger. That’s probably because I’m greedy! 4. 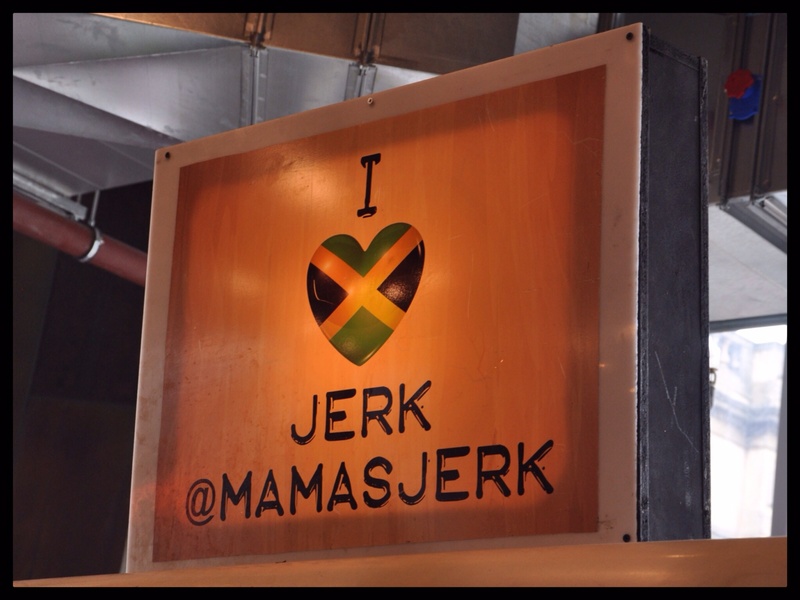 Mama’s Jerk Station is run by London-based Adrian, with experience working as Head Chef in other establishments he wanted to branch out and do his own thing. 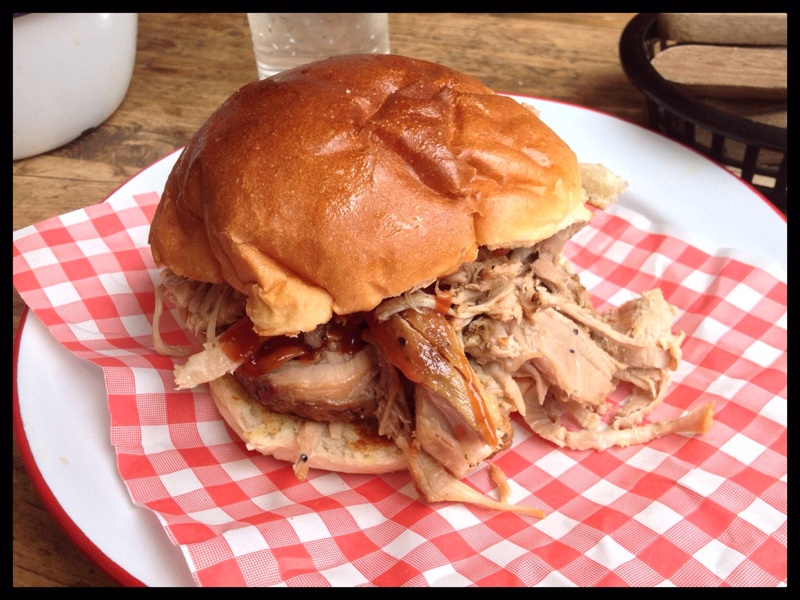 Mama’s was set up in 2009 and are regulars on the street food scene, trading at both Brick Lane and Waterloo. 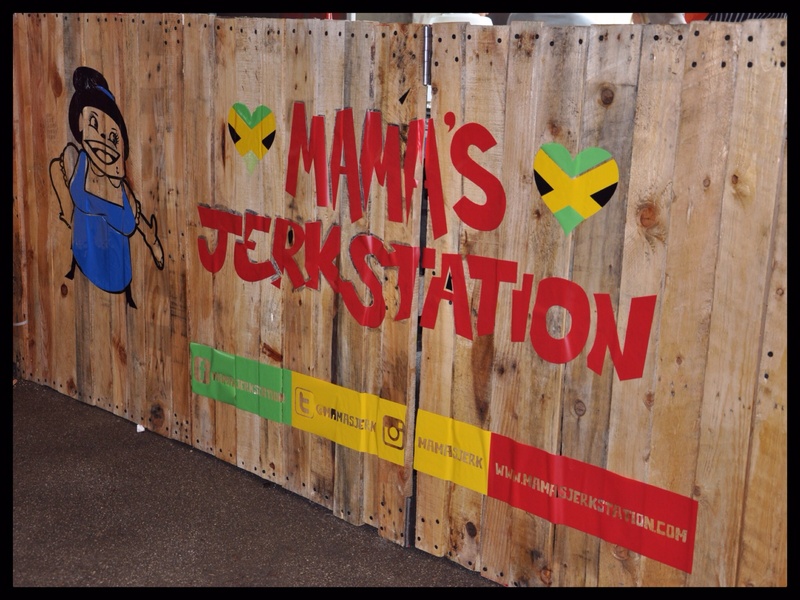 Serving authentic Caribbean food inspired by Great Granny Charlotte, Adrian uses an inherited recipe of Jerk seasoning and marinade from his Great Granny, which he’s adjusted to give his own twist. 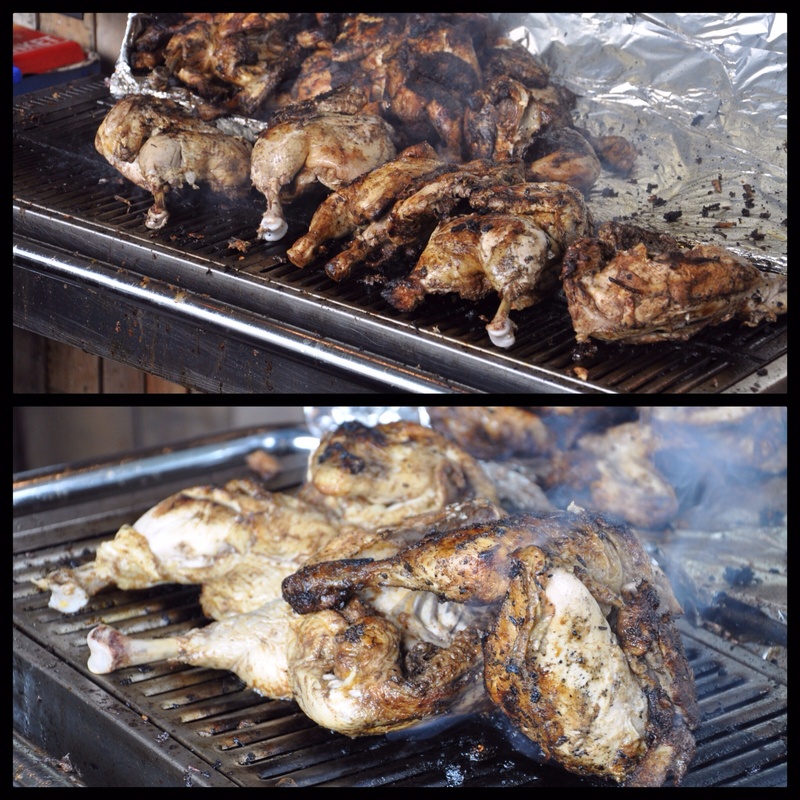 All the chicken is marinated for 24 hours and cooked on the BBQ, non-meat eaters aren’t left out with fried plantain and Veggie bean cake. 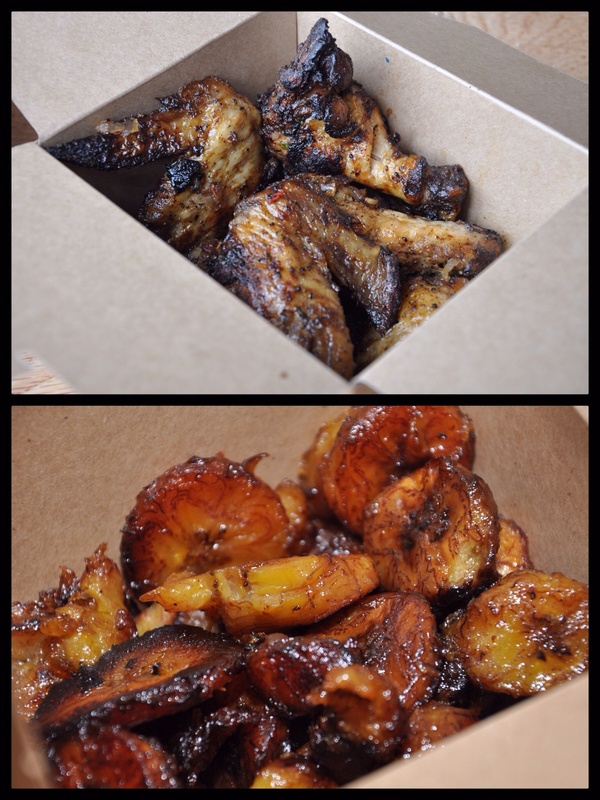 I had the wings which were sticky, flavourful and juicy, also the plantain which were caramelised and incredibly more-ish. Prices: £3 – £10. 5. 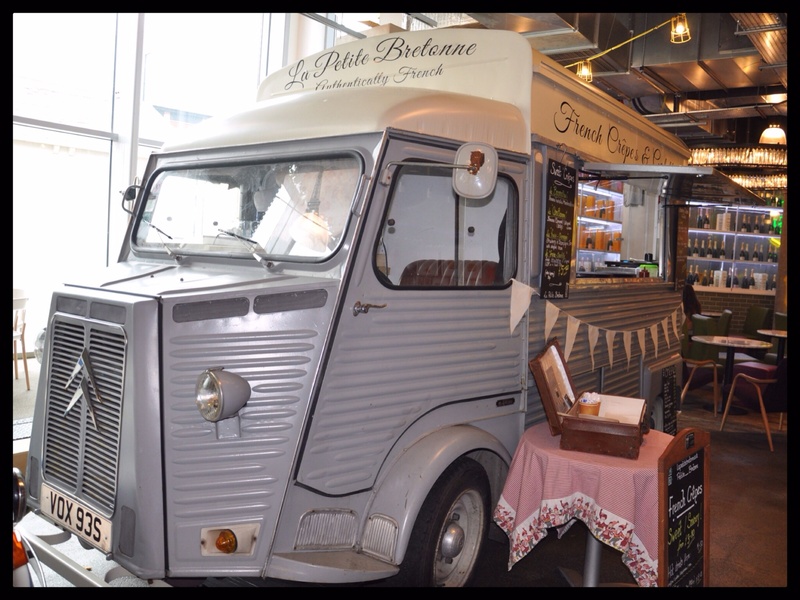 La Petite Bretonne brought to Trinity by the Huddersfield-based duo Xavier and Caroline, serving freshly made sweet crepes and savoury galettes from the Citreon H Van. Prices: £3-£5.50. 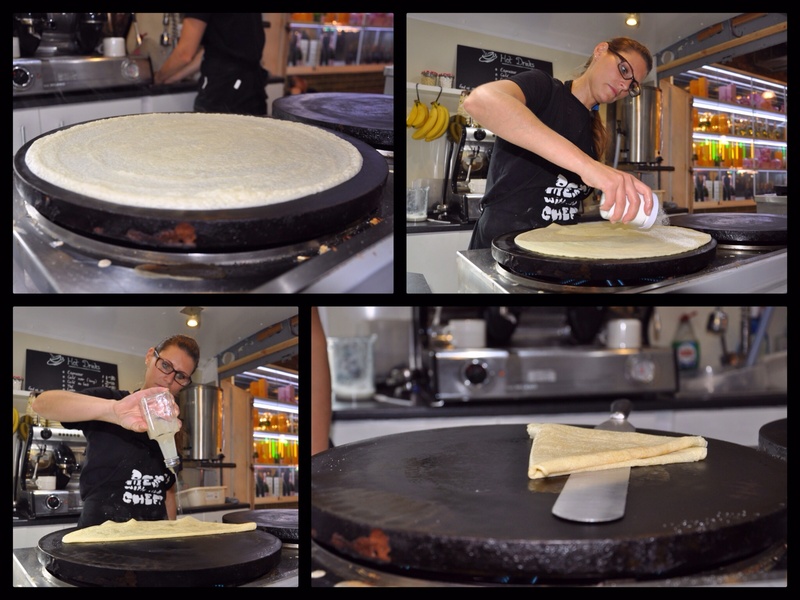 I was too full for a galette so chose a simple crepe instead, I’m a lemon & sugar kinda girl so after a few minutes was tucking into one. 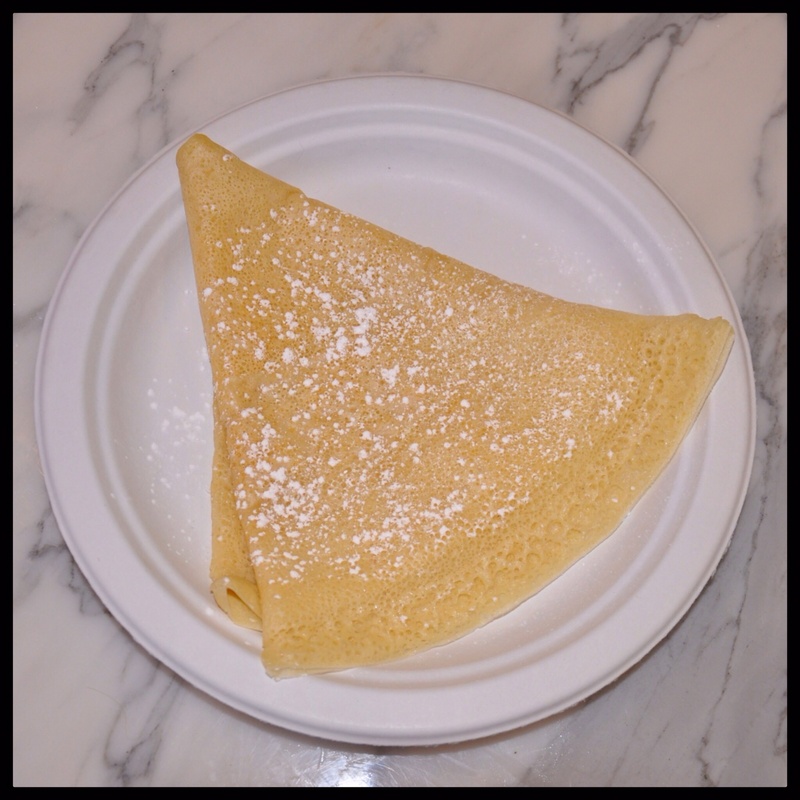 The crepe was uber thin and the batter was lovely and light. With a dusting of icing sugar it had sweetness, but I would have loved more lemony sharpness, also for my crepe to be a tad more golden but that’s just me. Enjoyable nonetheless!! 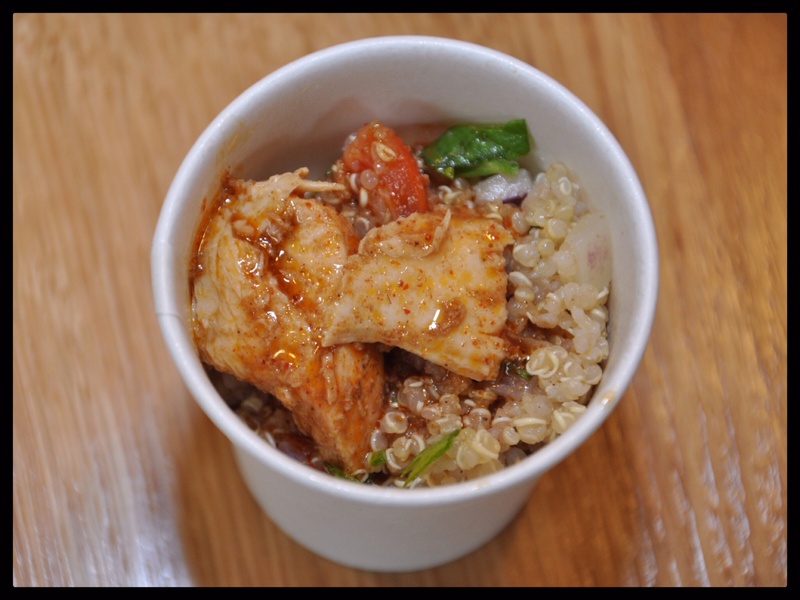 Are there any street food traders you’d like to see at Trinity Kitchen? Are you still interested in going to Trinity Kitchen, or do you think it’s lost a little bit of it’s early lustre? Last Sunday came the second of two half marathons I’d entered, spread over two weekends, this time in Edinburgh. The Saturday before meant carb loading time again, as I was staying with my mate near Glasgow we ventured around the city centre in search of lunch. I’ve had some fantastic meals in the city, a notable one was at The Butchershop Bar & Grill on Sauchiehall Street, but as my knowledge is limited I left it to my friends who knew the city well to choose. We walked up to a place with a brilliant name Bread Meats Bread, on entering it was easy to see the place was a popular one, as it was standing room only and we, like others joined the queue. 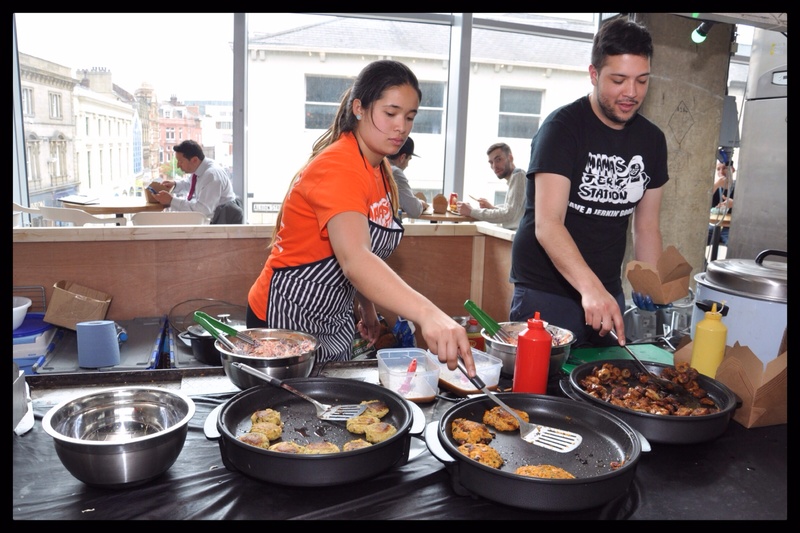 This gave me a chance to have a nosey and watch the kitchen at work – bowls of Poutine, fantastic looking burgers and sandwiches were coming out thick and fast. Immediately I thought we need one of these in Leeds!! Bread Meats Bread opened in 2012 with the ethos of serving quality, ethical ingredients, all prepared and cooked in their open kitchen. Fortunately table turnover was relatively swift and we were sat at a table within ten minutes. For a nosey at the menu click here, this place is perfect for a hungry carnivore, but sadly for non-meat eaters you may think you are left with slim pickings. 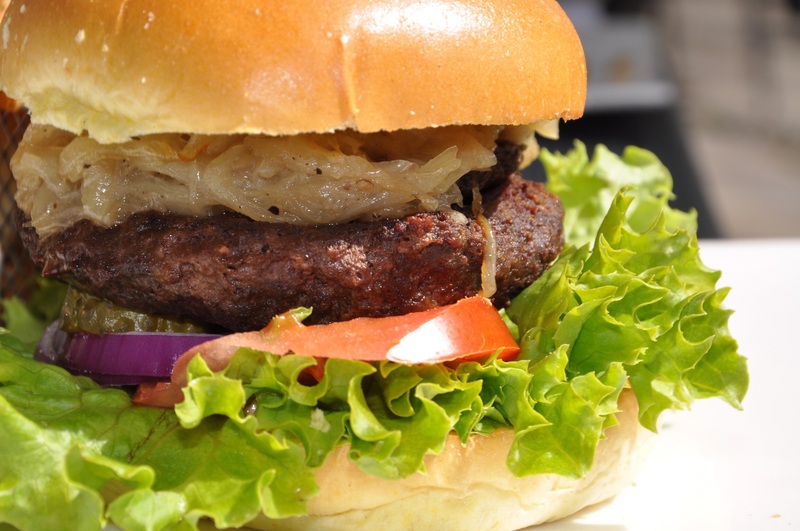 Their menu consists of burgers, sandwiches, Poutine, gourmet dogs, salad with a number of side dishes. 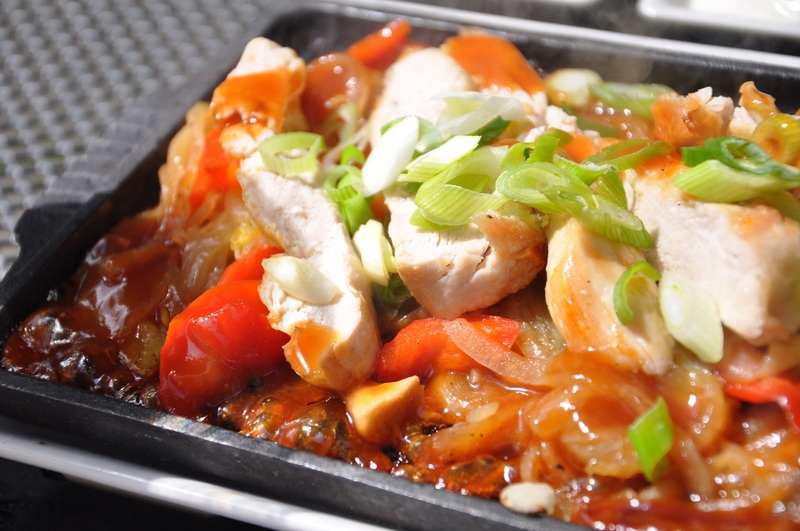 Prices range from £4.50 – £10 for main dishes and sides are £1.50 – £3. It took us a while to decide as there was lots of choice, but in the end we all went for some sort of sandwich, following the theme of ‘Bread Meats Bread’. Personally I was sold on the Porchetta sandwich with Bacon chips. Just moments before we received our own food, I spied a sandwich and burger being brought to a table behind us, this was evidence enough of the prospect of a mighty feed. 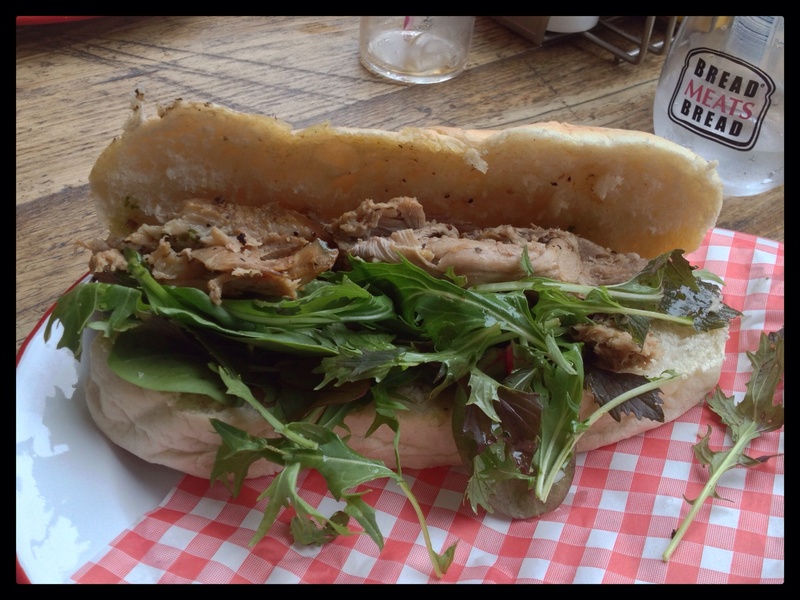 My Porchetta sandwich was massive, a lovely soft Brioche bun was packed with soft, flavourful meat. Lots of flavour from herbs making it incredible enjoyable. I’d ordered a portion of Bacon chips, not realising how big the sandwich would be, in hindsight I didn’t need them, but how was I to know I’d get a sandwich that was enough for two! 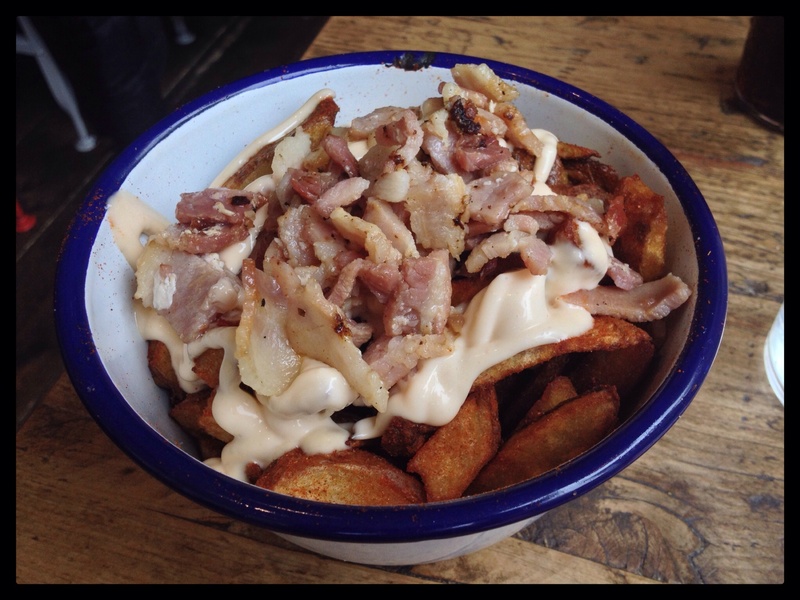 They were very good chips and the bacon was tasty, some bits could have had crispier fat though. The addition of mayo made the whole thing really moreish! On all accounts, both sides of the table were very happy – well fed and watered! Our bill came to £44 for 4 people, not including a tip. I’d definitely recommend Bread Meats Bread! Food: Great for carnivores, a little limited for non-meat eaters but when the name of the restaurant is ‘Bread Meats Bread’ you’d expect it. Service: Quick, friendly staff. Waiting time is short and there’s a fast table turnover. 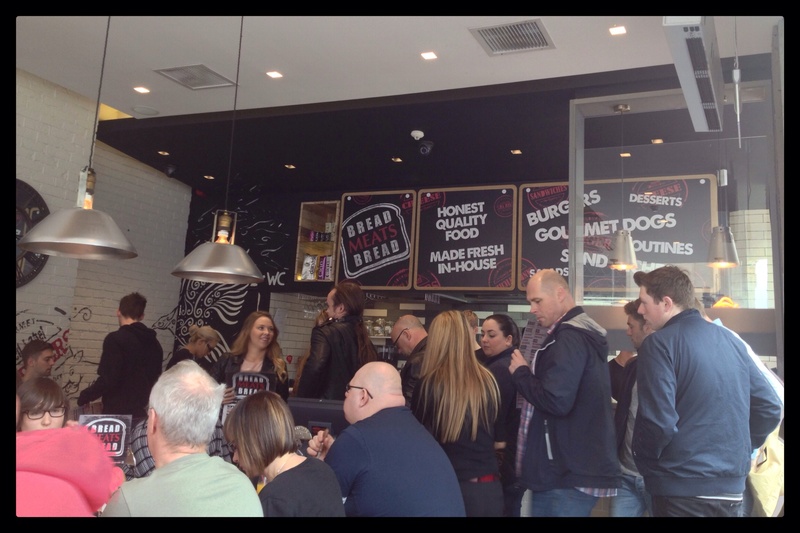 Atmosphere: Busy, lively atmosphere, with an open kitchen which allows the smell of tasty meat to waft over you while you wait. 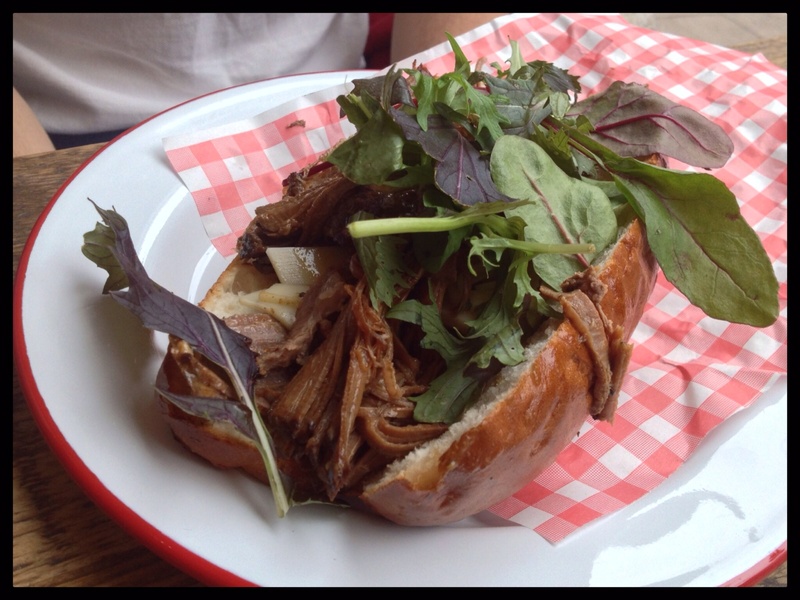 Do you have any ideas for great food in Glasgow, I’d love to add them to the travel itinerary for my next visit? 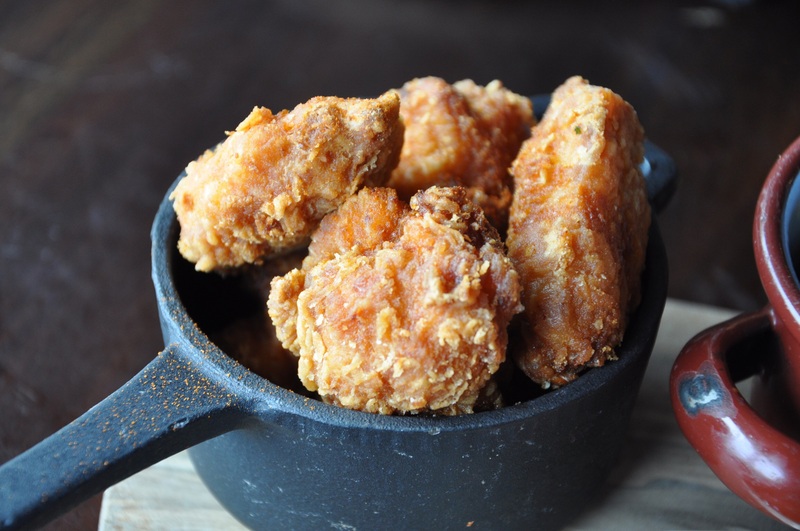 So West Side Story tickets had been booked months in advance, but for most theatre goers there’s the pre-theatre dinner and drinks to consider too. As you can imagine this suits me just fine, so my friend and I needed somewhere close by that she hadn’t tried before, meaning favourites Thai Aroy Dee and Fuji Hiro were out. 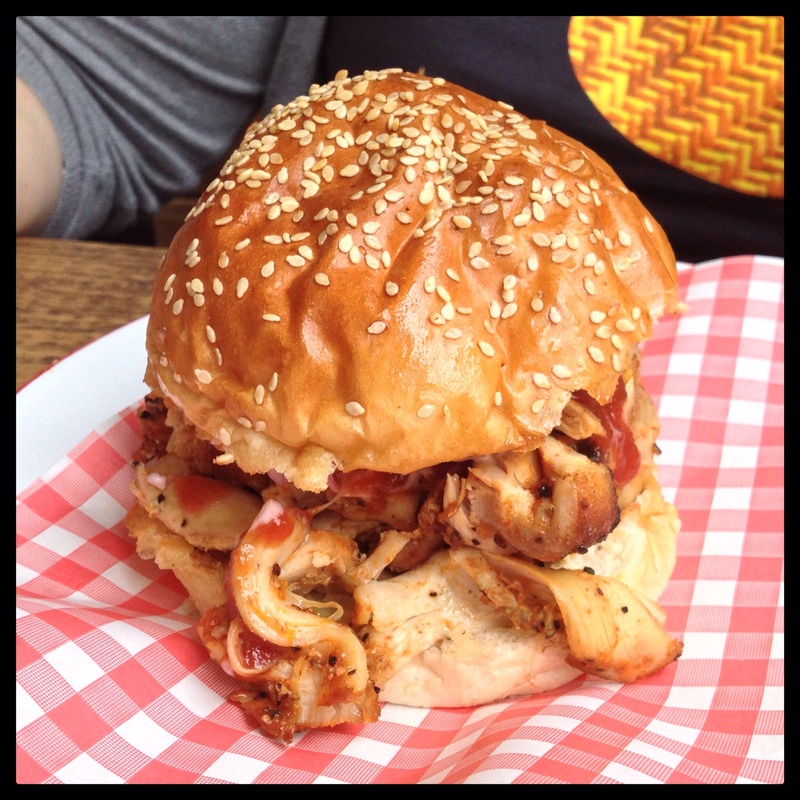 OK, The Belgrave; I love the place but it was rammed and we wanted to sit and eat without making a mess, I can’t eat a Patty Smith’s burger without getting it all over my face and hands so it was probably not the best option (this time). We opted for Sandinista next door, my last visit was last year, which I remember was pretty good. To read my write up on this previous occasion click here. 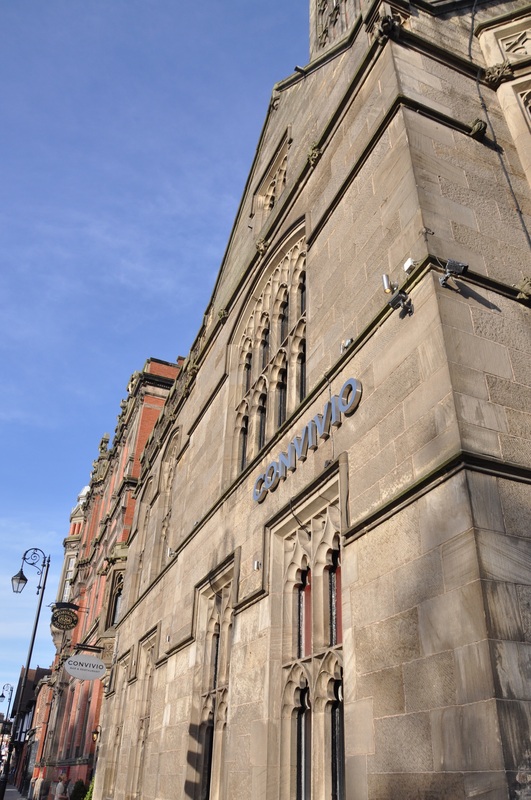 Since then Sandinista have worked with Anthony Flinn and devised a new menu full of Spanish-inspired dishes in ‘Pots, Pans and Cans’. 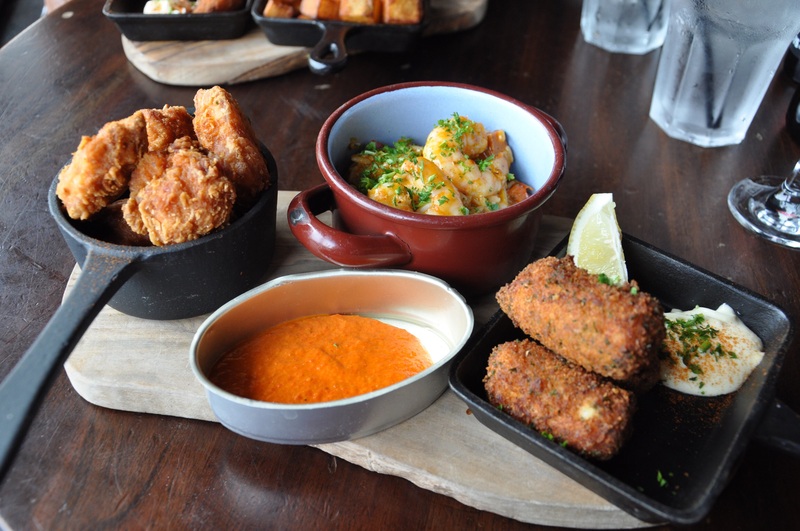 As well as a selection of tapas dishes, there’s meat and cheese that can be selected to build your own platter. There’s so much I could have feasted on, but we had to be out within the hour and seated to watch Maria and Tony sing their hearts out, whilst falling in love on the backstreets of NYC. We were lucky to grab a table as Leeds had a lot going on that evening, especially as Prince was performing at the First Direct Arena, which answered the question why so many people were dressed in purple (requested by the man himself). 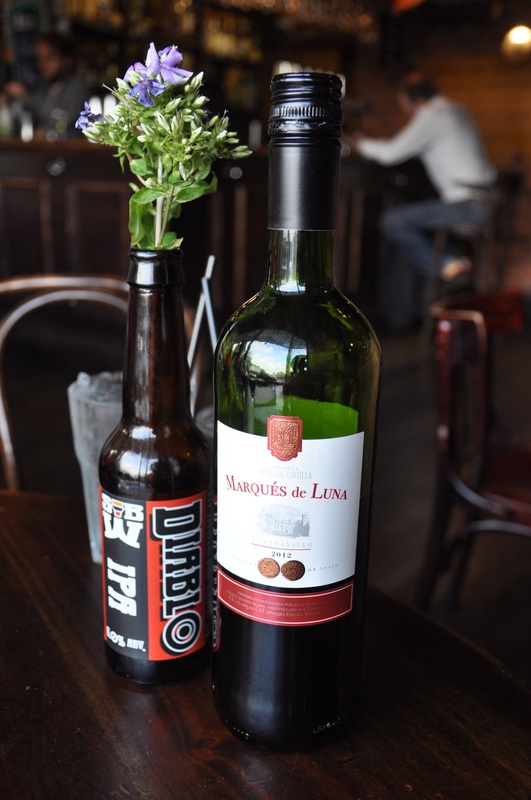 We quickly ordered our food and a bottle of Tempranillo, something easy drinking and moderately robust. Our server said that our food would be ready in approximately ten minutes, giving us plenty of time to eat, drink and saunter across the road to The Grand. Food arrived soon after, the sight of six pots, pans and cans full of food was a mouth-watering sight if ever there was one. My chicken wings were yummy! With an exterior that was perfectly crisp, the first bite unveiled the juicy flesh making these morsels ‘finger-lickin’ good’. The red pepper sauce was an excellent accompaniment with lots of flavour. 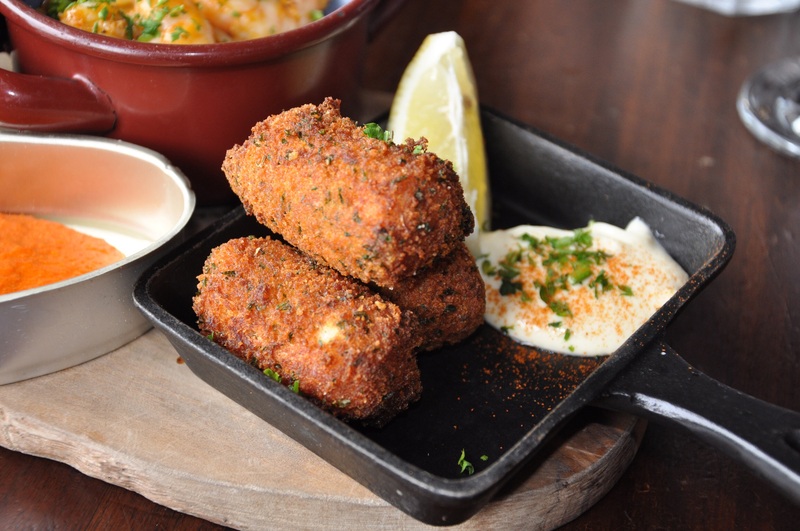 My croquetas were packed with meaty fish possessing just the right level of saltiness, all inside a lovely crisp, breadcrumbed crust which encased the whole thing. 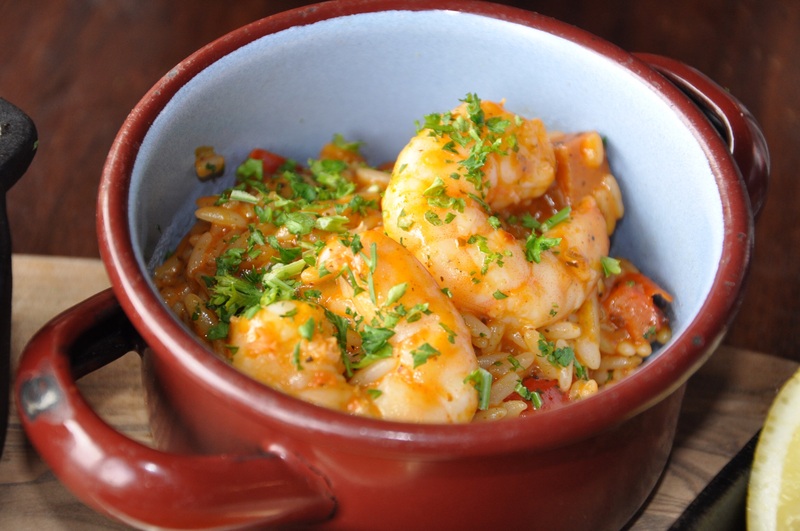 Lastly my Jambalaya was a wonderful bowl filled with large juicy prawns, full flavoured sausage and al dente rice, that small bowl was a triumph packed with building heat and tasted great! The noises from the other side of the table echoed my own! I tried some squid which was delicately crisp with a tender interior and by all accounts the other two dishes were equally as good. Our Pre-theatre feast with a bottle of wine was just a few pennies short of £40. I thought it was pretty well spent, setting us up perfectly for a night at the theatre. Food: A decent size menu with a good selection of dishes, plenty for meat lovers, vegetarians, also always fantastic to see gluten-free and vegan options highlighted. Service: Staff were friendly and very helpful. Service from both kitchen and the bar was quick and they are obviously used to bringing out dishes quickly and have a brisk turnover. Atmosphere: It was a Friday evening so the place was packed and there was a real tangible buzz about the place. 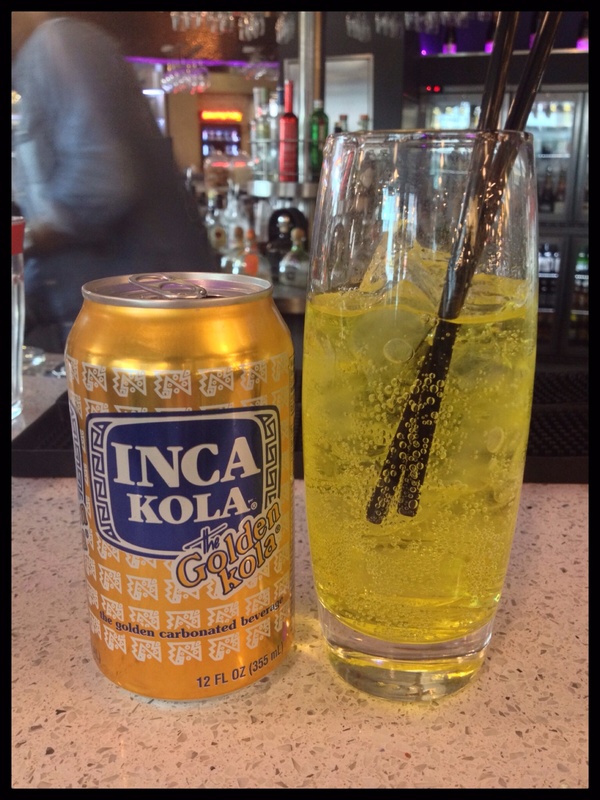 I’d definitely recommend Sandinista, pre-theatre or not! 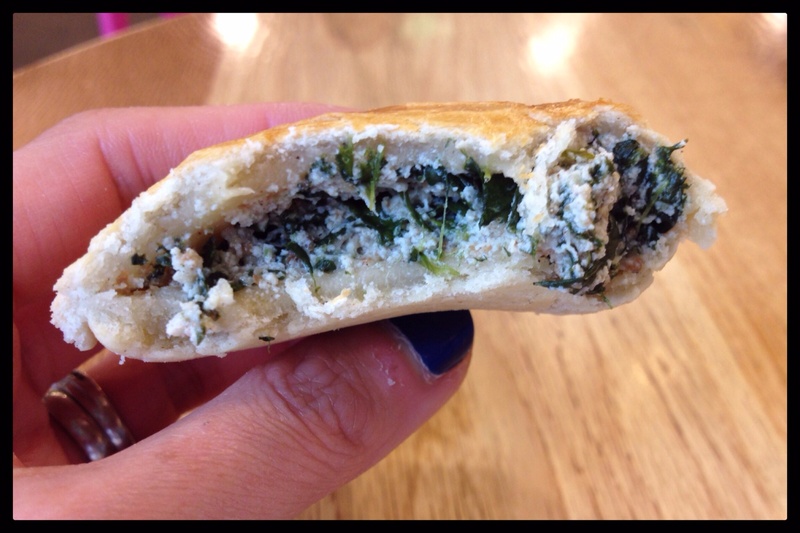 Where do you venture out for a Pre-theatre menu, where’s good? On what felt like the hottest day of the year so far, myself and nearly 7000 fellow runners stomped around Chester two weekends ago. It was the perfect weather for so many good things; a BBQ, day out, picnic or drinks in a beer garden somewhere, not so much for a half marathon!! Many of us suffered in the heat that was approximately 20 degrees in bright sunshine. Oh my, it was difficult, it felt so much harder than running the full marathon! Having drenched myself in bottles of water for most of the race, all with the aim of keeping myself cool I looked pretty saturated when I crossed the finish line. Myself and an old Uni mate had entered, being an elite runner he was twenty minutes ahead of me so once I’d finished it was time to refuel to replenish lost nutrients. The heat and blazing sun had really taken it out of me this time, so I literally just followed and wasn’t really bothered where we went, all I craved was a cold drink and something to eat in the shade, as by now I was ravenous. 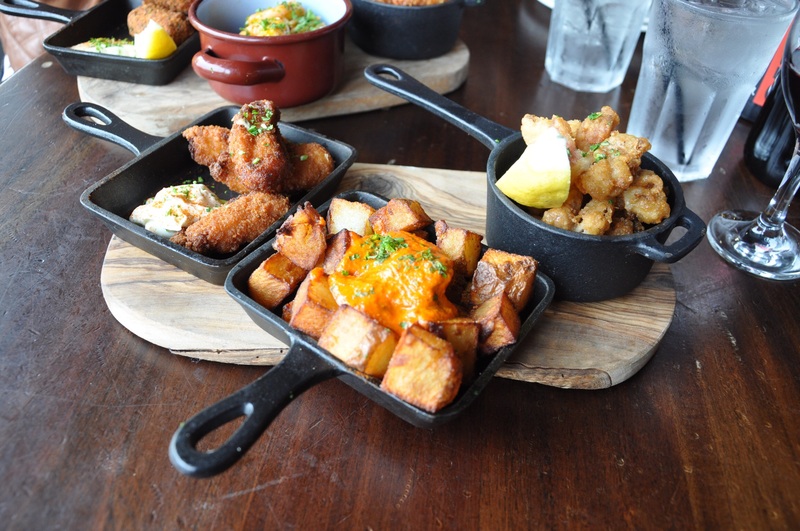 We strolled into the Blackhouse Grill, turning up at 11:30am and were luckily able to sit and have drinks, our food orders would be taken at 12pm. 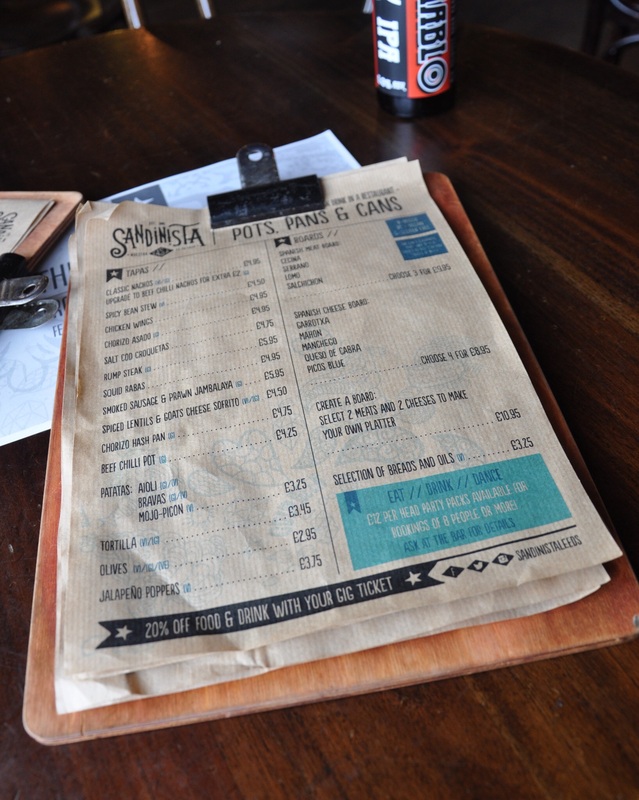 The menu is much the same as the Leeds branch, with steaks, burgers, salads, fajitas, fish and chips. Traditional Sunday roast was on offer too. Myself and the other half went for the Steak frites, Pete the burger with additional mushroom and his girlfriend the Chicken Fajitas. Both steaks were cooked perfectly, lovely and pink, it is a grill restaurant so it should be. 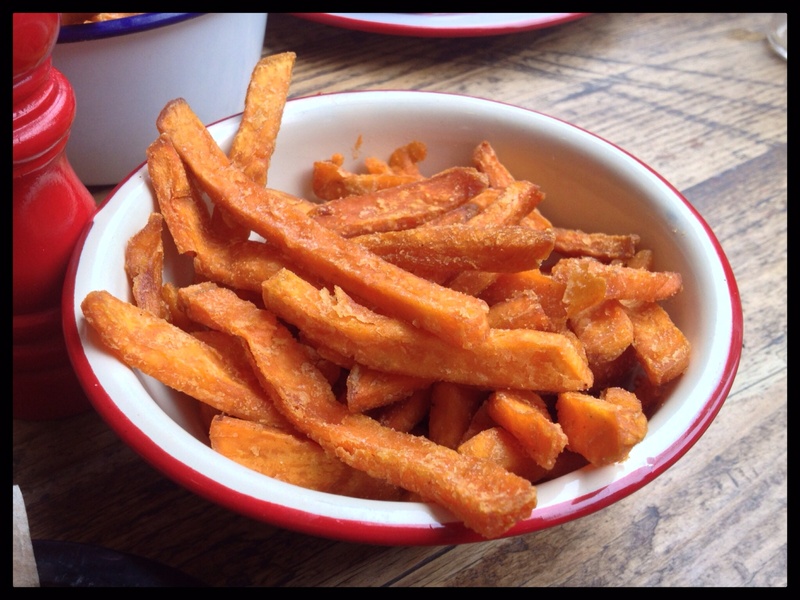 Plenty of really good skin on chips were given, with a crisp outside and fluffy inside. They did get a little soggy though from the residual oil on the plate though, I think that would have been my only complaint. 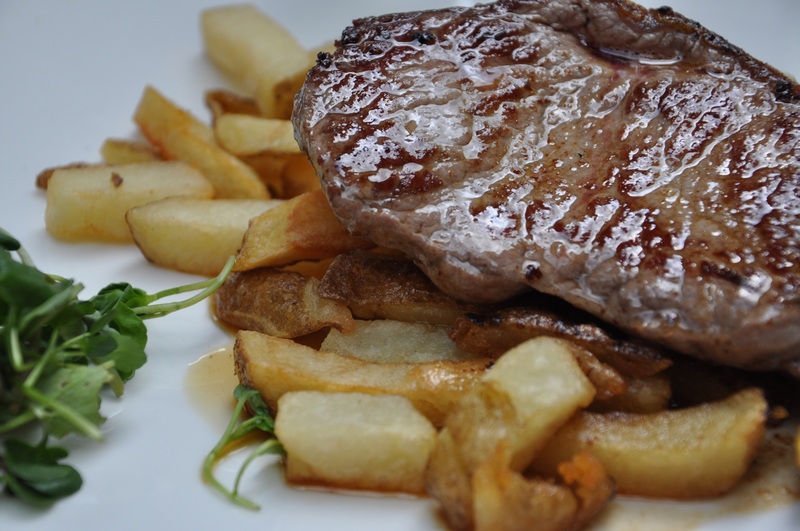 The steak itself was juicy and flavourful, the restaurant happily proclaims using premium quality beef that’s aged for 28 days ensuring flavour and tenderness, it definitely showed. Oh yes, also the fact that myself and our friend both had loads of little bits of chips which made up the portion, especially Pete, when he tipped out the gimmicky frying basket full of chips, about half were really small off cuts, Pete was a little miffed! Pete admitted himself that he’s not the most discernible of diners, but when asked about his burger, he said it was cooked as requested and had good flavour to it. He did find the over-sized piece of lettuce and tomato a bit pointless, so removed them immediately leaving in the additional toppings of mushrooms and onion he’d ordered instead. 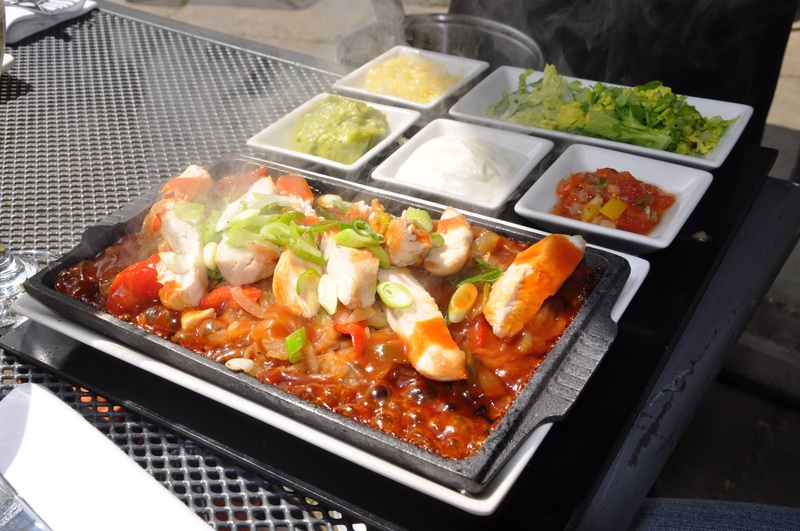 The chicken fajita looked and smelled great as it was brought over, still sizzling away on its griddle. It was an all-in-one cooking/preparation dish. Lots of additional bits like guacamole, cheese and pica de gallo on the side, a few warm tortillas wrapped in a napkin. One thing that was commented on straight away was the difficulty in constructing the fajitas, as they’d only left a knife and fork to use, no spoon so constructing the Fajitas was a task in itself. The chicken was cooked well, still moist and the sauce underneath had tonnes of flavour and I must admit it smelled fantastic. But there was nowhere near enough chicken or cheese to fill the tortilla so some wrappers were left unfilled. Overall we had a lovely celebratory lunch at The Blackhouse, The total cost for four people was £84, without tip. It sounds a tad steep considering we had just one course each but the wine was £19.75. To be honest, I would have eaten probably anything after the race I was that hungry, but it was a decent choice. Considering Blackhouse is part of a chain and probably not somewhere I choose myself, it definitely has its merits and I would recommend it. It’s good for celebratory meals, family gatherings and the like. 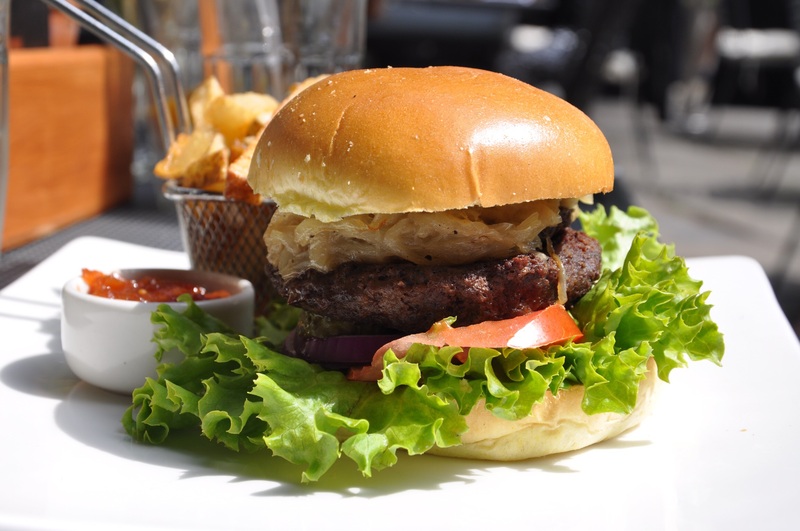 Food: A good choice, especially for meat lovers. Atmosphere: It was quiet when we first arrived, but while we were there it became much busier and the atmosphere improved. Service: Pleasant staff, very welcoming and service throughout was good. One of my hobbies, when I’m not stuffing my face full of food is running. I enjoy it, it keeps me fairly fit and with the amount of food I eat, it’s a good job! 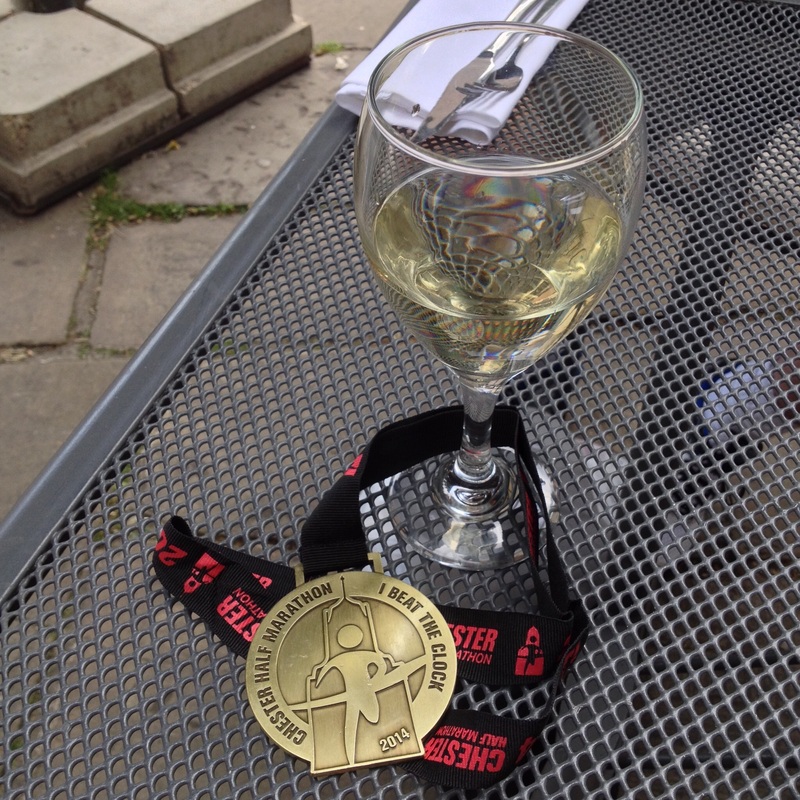 I’d entered two half marathons over consecutive weekends, with my first being in Chester. The need to carb up the day before is really important, what a great excuse for a hungry eater like myself! Now I didn’t do my usual planning and research beforehand, so when we arrived it was on spec that I starting looking for somewhere to get a tasty bowl of pasta. My first choice La Fattoria, supposedly the best Italian in the city centre, as reviews on the internet go anyway, was fully booked, even at our desired time of 6pm! So where else would we go? 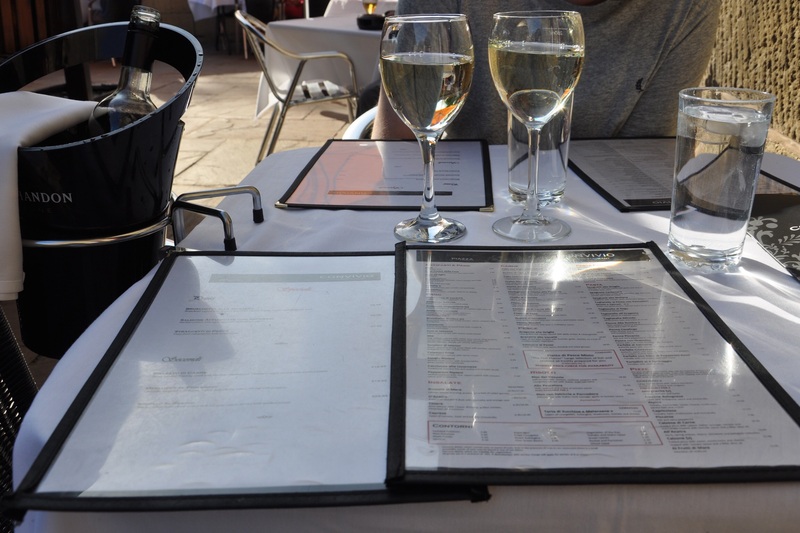 As we drove to our hotel near the racecourse, we passed an Italian called Convivio, a table was available so we turned up at 6pm, choosing to eat outside as it was a beautiful evening! A nice refreshing, crispy dry white was ordered, decent it was too and just what was needed on a warm evening. 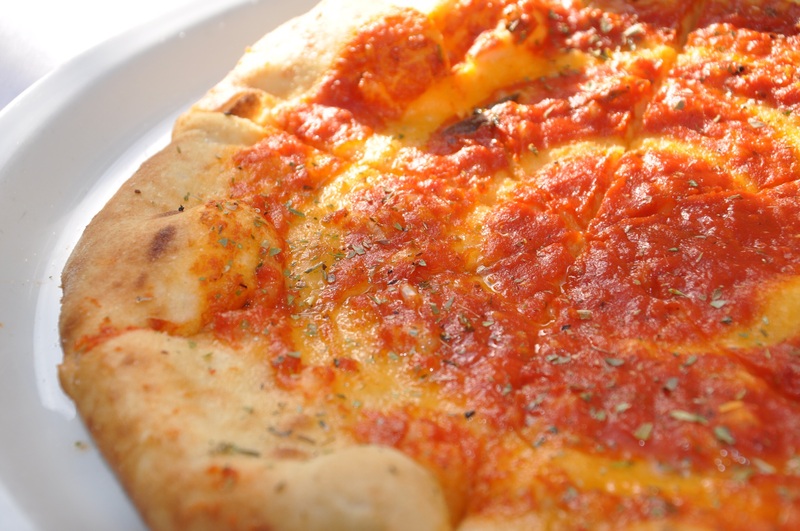 With a menu full of typical Italian dishes I knew I was going to choose something carb heavy, simple and straight forward so a Garlic pizza bread with tomato and basil, then Tagliatelle al Ragu was my choice. Whereas the other half opted for Cod goujons as a starter on the specials menu, then really fancied a steak and settled for the Fillet in peppercorn sauce. He was a little disappointed as he prefers steak to come without sauce, but hey, as long as it was a good piece of meat cooked well, he’s usually quite happy. Service was friendly and brisk from the start, meaning our order was swiftly taken. As we were both starving seeing the starters arrive within ten minutes also made us both very happy. So far so good, but what was the food like? Wish any dish I find it odd if a salad or additional components take up more of the dish than the main ingredient itself. 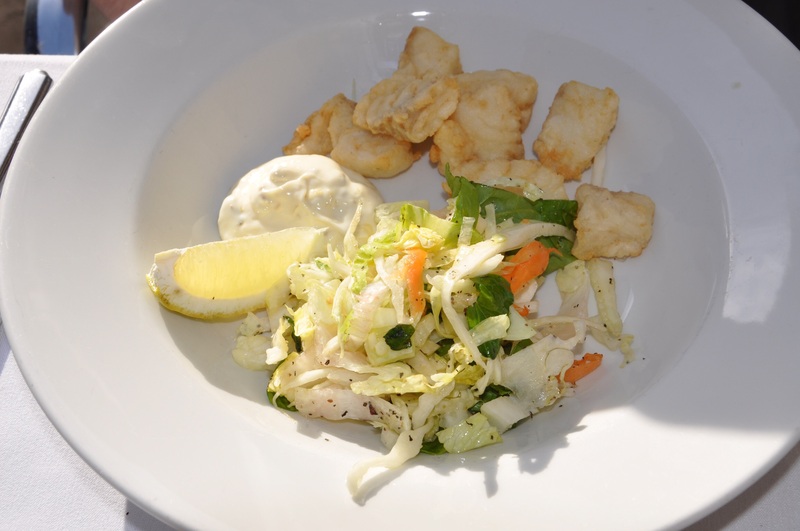 This is what happened with the Cod goujon starter, where salad and tartare sauce took up at least half of the bowl. 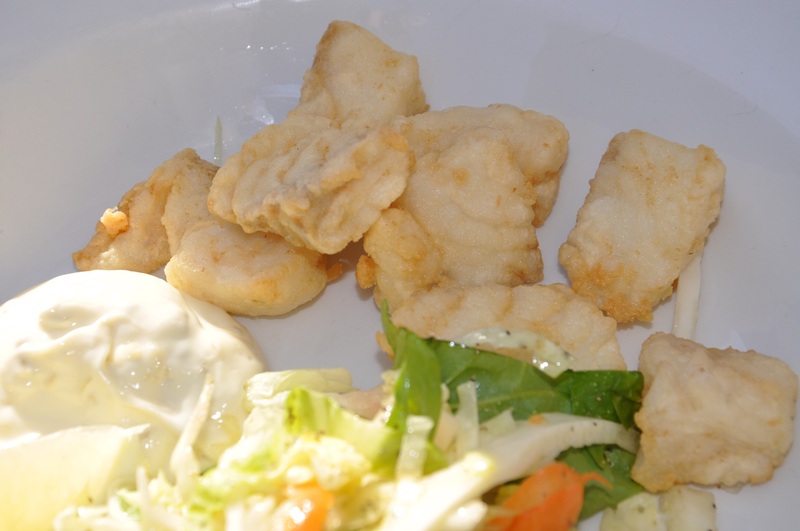 The goujons also looked a little anaemic in my opinion, but on taste the other half said they had a lovely, light, crisp batter and were cooked well. The tartare sauce was well received, but I thought it looked a little sparse on the caper and gherkin front. My first course of garlic bread was a bit of a cop out really, but I just wanted tonnes of carbs and garlic bread is an easy way of getting some. Topped with tomato sauce and basil it had good flavours, the dough was a smidgen thicker than I would have liked, but it was tasty on the whole. We’d noticed that the place was quite quiet, a little surprising since it was a gorgeous Saturday, and with an outside dining area I would’ve expected more people to be eating here. Maybe they were all in La Fattoria? Our starters had given us a taster of what was on offer, not perfect though so I was in anticipation of some good main courses to make up for this. 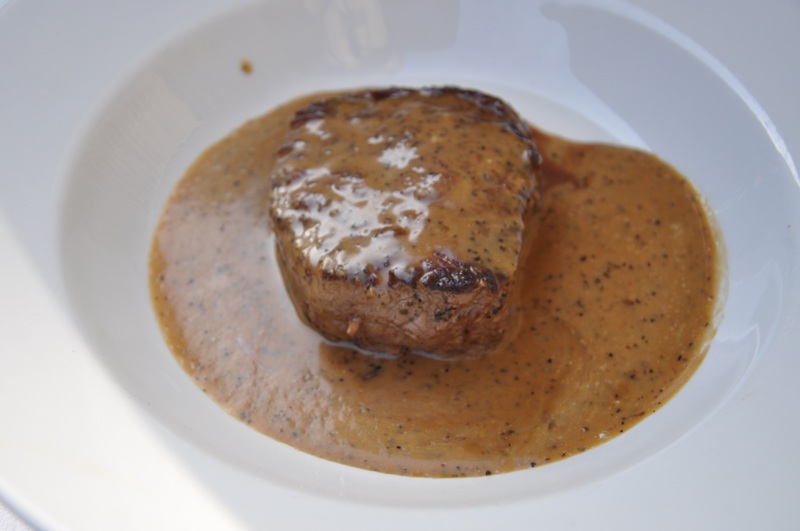 The other half’s steak was up first, served in a peppercorn sauce, he’d asked for it medium rare, which it was. Flavour wise it was full of meaty goodness. Yes, maybe not like a rib-eye or a rump, but tasteful all the same. 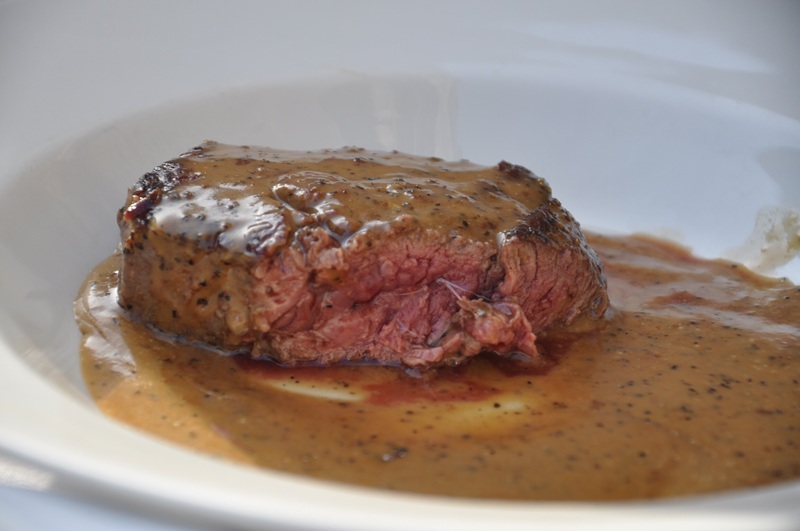 The peppercorn sauce, as I said earlier is not normally an accompaniment that he would have chosen, preferring his steak to be served without sauce. He did try some but it just reinforced why he prefers his steak naked, finding it too peppery and it’s consistency a little gloopy, so this was remedied by scraping off as much as he could before tucking in. 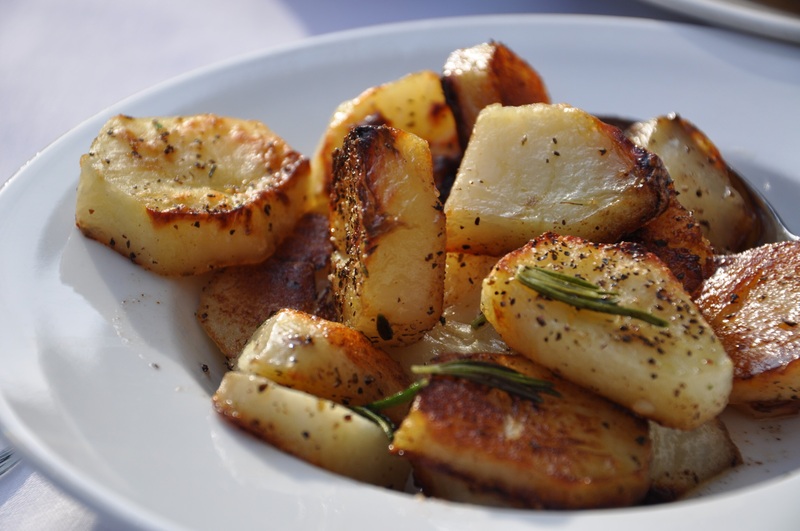 The sautéed potatoes were good, cut quite big and a decent portion too. Lovely and fluffy in the middle whilst their exterior were well coloured and crisp. The hit of rosemary with potato always does the job so was an excellent choice. Maybe I watch too many cookery programmes on TV, but don’t they always say that the pasta and it’s sauce should be incorporated together before serving. In addition there should be just the right amount of sauce to cover the pasta, but there shouldn’t be excess. This unfortunately wasn’t as it was just ladled on top. 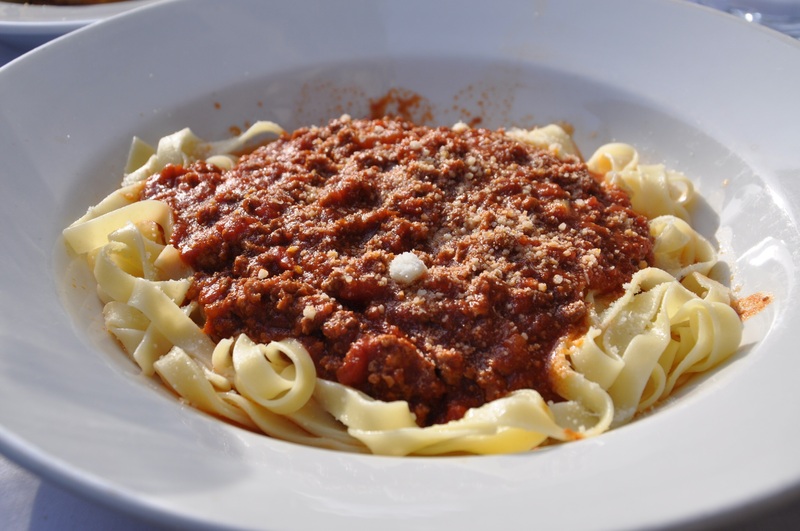 The last bowl of pasta with a ragu (bolognese) was my carb loading meal before The Yorkshire Marathon last October, that was very much a different affair and was a truly delicious bowl of pasta. Done simply but with bags of flavour. Fast forward six months and it was like déjà view but not! The flavours were nice, such an awful word to use when describing food! The tagliatelle was al dente and even though the ragu had flavour and coated the pasta sufficiently once mixed, it was a little watery. The cost of our meal for two people was £72.80 (2 starters, 2 main courses and a bottle of wine). 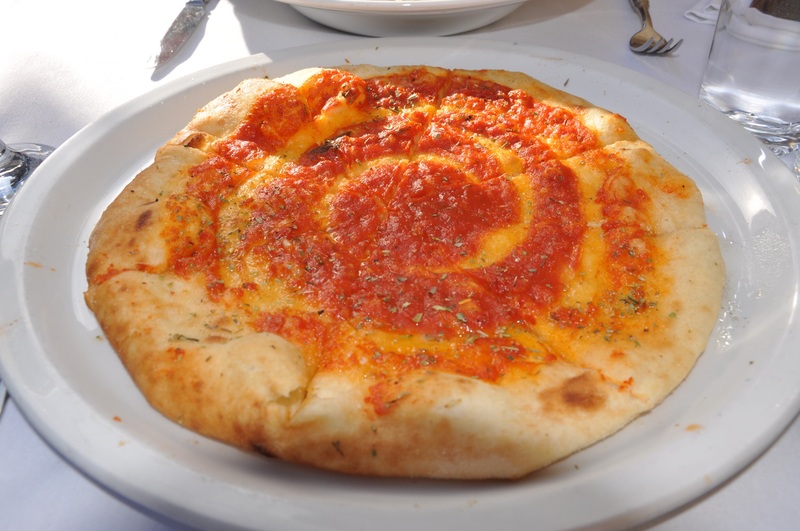 Food: A large menu full of classic dishes and a few specials. Dishes on the whole are more expensive than you would expect. An in comparison with La Fattoria (my first choice) it was quite a bit more expensive. Quite tasty, but definitely room for improvement in my opinion. Service: The staff were friendly and efficient. Atmosphere: For a warm Saturday evening it lacked the atmosphere that I was expecting, indoors it could have been different but I’m unable to comment on that. Even though it was a pleasant meal on the whole, I don’t know if I would go back again, especially with the knowledge that there’s arguably a more superior restaurant nearby. I would recommend it, but only if you don’t have any better offers.